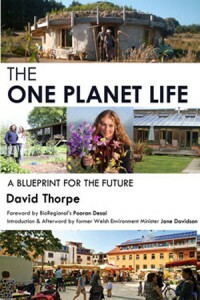 This week’s other “must-read” book is “The One Planet Life : a blueprint for Low Impact Development “ by David Thorpe, which explains the idea of One Planet living, and the One Planet Development planning policy in Wales. David Thorpe is a writer and consultant on sustainability issues. He is a Special Consultant on Sustainable Cities Collective, the primary website for urban leaders globally; a founder and core group member of the One Planet Council; and the author of several books on sustainability, including: Energy Management in Buildings, Energy Management in Industry, Solar Technology and Sustainable Home Refurbishment, all in The Earthscan Expert Guide series. Prior to this he was the News Editor and Opinion Writer of the UK’s Energy and Environmental Management magazine for 13 years. Before that he was director of publications at the Centre for Alternative Technology. Ecological footprint analysis is a way of working out how much of a country’s sustainable resources, or how much of the world’s resources, we are using. At the simplest level, if you divide up the usable land of average quality between the world’s population as it stands today, there is about 1.8 ha per person. But we are using resources at more than twice that level, at 4.9 ha per person in the UK. We are living as if we have more than one planet available to us. One Planet living embodies the reality that we are consuming the planet’s resources in a way that is unsustainable: we only have one planet to live on, and our use of it must be reduced to a level which is sustainable for the long term. At woodlands.co.uk we receive a steady stream of enquiries from people who want to buy a woodland to live in. Most of these enquiries are from people who want to change their way of life, not just find a healthier or cheaper alternative to conventional housing. One Planet Development in Wales offers a planning policy under which such dreams may be turned into reality. However, the reality is that it is not an easy option. In 2009 Jane Davidson, the Welsh Minister for Environment, Sustainability and Housing in Wales , was instrumental in driving through the new planning policy for Wales enabling so called “One Planet Developments”. In her forward to this book, Jane Davidson offers the opinion that to be granted planning permission for a One Planet Development is ”….a privilege ". The successful applicant is being given permission to live on agricultural land when others cannot; the ‘system’ has designated him/her an appropriate guardian of the earth, a teacher and leader of others, a prophet and scientist for future generations….”. Not a style often heard from Government ministers! “The One Planet Life” explores the principle of One Planet living, and the One Planet Development planning policy in Wales. The book also sets out to inspire us all to realise we can make a difference, even if we are not ready, maybe never will be, for the full commitment of a One Planet Development. Every time I visit people who have had the commitment to pursue a one planet life, like the Lammas project in Pembrokeshire, I come away with a reinforced respect for those who have the commitment to pursue their vision, a lingering sense of longing to be somewhere like it, but a realisation that I fall into the second group, of those who will probably never have the commitment for a One Planet development. The first part of the book explores the evidence for a need for change in the way we use our planet, including the role of ecological footprint analysis. It explores methods of food production and whether the UK, for example, could feed itself. In 2012, the UK imported 42% of the food we ate, but a study has concluded the UK could still feed itself. The next part of the book explores the practical details of finding suitable land and preparing a management plan. An ecological footprint reduction is a key objective of the One Planet Development policy, and how that will be achieved must be clear in a One Planet Development management plan and planning permission application. The policy sets the burden of proof at a high level that the applicant's plan will achieve the required reduction in ecological footprint compared with the average in Wales. The third part of the book looks in detail at the practical day-to-day details of land management, water supply, energy, buildings, food, and transport. One Planet Developments in Wales are typically applicable to a rural setting, but it is feasible to pursue one planet living objectives in an urban environment as well. The fourth part of the book looks at numerous examples of successful one planet living, and a couple of less than successful initiatives. including BedZED, the Beddington Zero Carbon Development in South London. For anyone who is thinking they would like their own One Planet Development in Wales, or looking for ideas of how they can make a practical difference, this book is essential reading. It contains a wealth of detailed statistics and references to numerous reports and sources to back up the data, together with very practical hands-on advice, on everything from generating power to how to build a composting toilet. It closes with an afterword from Jane Davidson on how, with its Well Being of Future Generations (Wales) Bill, Wales has a vision of a sustainable future, and with a call to action.